done quickly. The new range of tyre changing equipment (TCE) from Bosch has been specifically designed to provide technicians with a safe, versatile and importantly time-saving operation. The user friendly TCE range from Bosch is suitable for passenger cars, motorcycles (only with additional accessories) and light commercial vehicles. 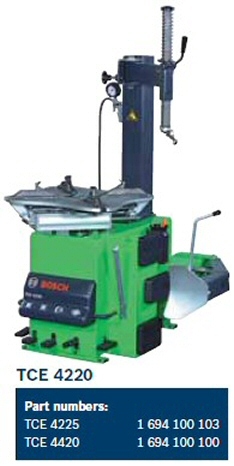 Improved clamping to safely and securely hold the wheel and reduce the possibility of damaging the alloy or polished rims while tyres are removed and refitted. Better mounting capabilities to ensure tyres are fitted quickly and safely. Can accomodate tyres with up to 30" diameter rim and 22" width. Special mechanical lock for vertical adjustment. The TCE 100 is an automatic mounting head for the TCE 4460 and TCE 4465 which upgrades your TCE 446X to a "lever-less" system. It substitutes the lever for pulling the bead out of the rim, reduces possibility of damage to the alloy and reduces manual work to a minimum. 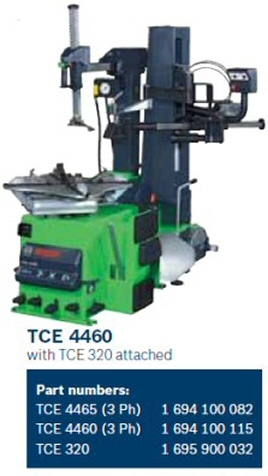 The TCE 200 is a helper device for the TCE 4220 and 4225. 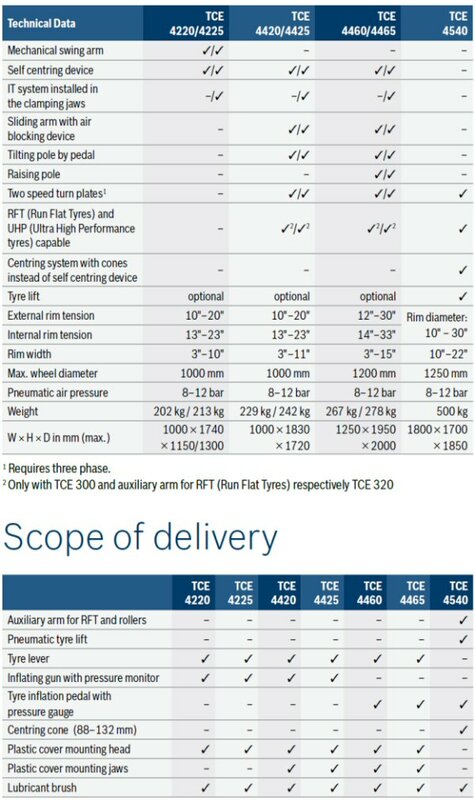 The TCE 200 is not recommended for RFT (Run Flat Tyres) and UHP (Ultra High Performance tyres). 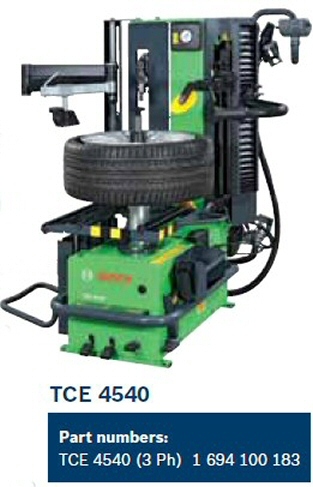 The TCE 300 is a helper device to enable the changing of RFT (Run Flat Tyres) and UHP (Ultra High Performance tyres) for the TCE 4420 and 4425. Various rollers and the pneumatic operation makes changing RFT (Run Flat Tyres) and UHP (Ultra High Performance tyres) convenient, easy and reduces rim damage. The TCE 320 is a helper device to enable the changing of RFT (Run Flat Tyres) and UHP (Ultra High Performance tyres) for the TCE 4460 and 4465. Various rollers, an auxiliary arm and the pneumatic operation makes changing RFT (Run Flat Tyres) and UHP (Ultra High Performance tyres) convenient, easy and reduces rim damage.